This week's Tuesdays with Dorie (TWD) recipe was chosen by Jennifer of Cooking for Comfort: Nutty, Chocolately, Swirly Sour Cream Bundt Cake. Cinnamon and sugar, nuts, chocolate chips, and raisins all mixed into a sour cream bundt cake. Wait a minute. Raisins?! Yes you heard me right - raisins! 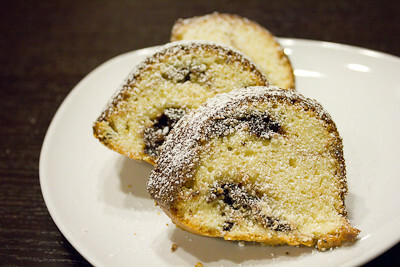 I know there are many raisin haters out there, but I can tell you that we loved this cake, raisins and all! This cake was deliciously moist thanks to the addition of sour cream. I didn't quite get the "swirls" I was expecting, but luckily that didn't affect the taste ;) You're supposed to spoon half the batter into the pan, sprinkle half the swirl in, then top it with the rest of the batter. You then create a "channel" for the rest of the swirl using a spoon and then you're supposed to cover the swirl with the batter that's on each side of the "channel." It's a fairly sticky batter, so this was a bit difficult for me. Plus there wasn't much batter to work with because my "channel" was fairly shallow (but that's what the recipe says to do!). Luckily I had a bit of batter left in the bowl that I was able to scrape together and use to patch over the top. Next time I'll probably just reserve a little bit for the end. This cake was so good. Let's just say that I made this yesterday evening, there were three of us munching on this cake, and as I write this there is half of a piece left! If you don't like raisins then leave them out (I left the nuts out of the recipe), but do substitute something like dried cranberries or apricots. I think the dried fruit really adds a nice flavor to this cake. Thanks Jennifer, for hosting this week. I'll definitely be making this again. If you would like the recipe, you can find it here. Also make sure you check out the TWD Blogroll, to see how everyone else enjoyed swirly chocolate treat! - I omitted the nuts so I increased the mini chocolate chips to 1/2 cup. - Some bakers had problems unmolding their bundt cake so be sure to butter and flour your pan well. - Careful when you are putting the swirl in that you don't get too much near the edges of the pan or else it will burn. - When preparing the cake, instead of using half the dough and then the other half on top, I would use a little less than half the dough for the first layer so you have some leftover to put on the very top to cover your "channel" or swirl/filling. - For more recipe tips, click here. Your cake looks wonderful, Jaime! I wondered about the raisins as I am not a huge fan...although sometimes they work beautifully. Need to try this one--everyone seems to have loved it! Beautiful cake and so glad you loved it. Delicious. I'm not a huge raisen fan though. sounds like you and your two friends had a good time with this cake! I didn't quite get the swirls I was looking for either. I cut the recipe in half so I did not have a lot of mixture to work with! Im glad you loved this cake..my family sure did!! I'm not a raisin lover but I could still see myself enjoying this cake. It looks awesome.